TS ECET Results 2018 declared today at 4 PM. Telangana Govt. announced the results of the TS ECET-2018 examination results at 4 PM in Hyderabad. 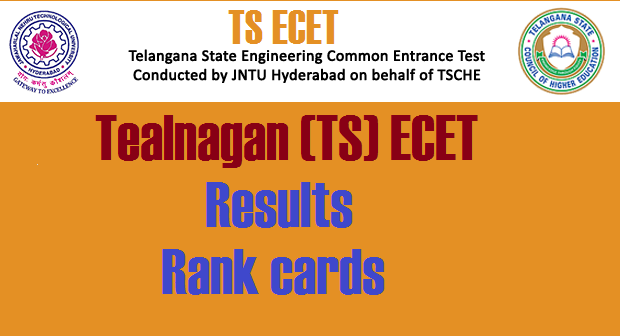 TS Engineering Common Entrance Test (ECET)2018 Results released. Students who are appeared TS ECET exam in streams like Engineering, B.Sc Mathematics can check TS ECET Results 2018 download TS ECET 2018 Engineering rank cards from here. The results of TS ECET 2018 has released. Candidates appeared for the entrance exams last month can check their scores and ranks at ecet.tsche .ac.in; vidyavision.com, manabadi.com, eenadu, sakshi. Near about 2 lakh candidates appeared for the 2018 TS ECET exam, out of which, more than one lakh students have successfully cleared the TS ECET entrance exam. The pass percentage for Engineering is 72.28 per cent.